The College of Natural Resources and Environment at Virginia Tech is the creator of the Virginia Big Tree Program, and the New River Chapter recently took a field trip to learn more about it. The purpose of the program is to find and record the biggest examples of many species of trees in Virginia. Measurements that are taken into account in the making a record tree are height, trunk circumference, and crown spread. Both native and non-native trees are listed in the registry. New River Chapter members and friends braved a cold January day to go on a hunt for the champion and remarkable trees on the Virginia Tech campus. 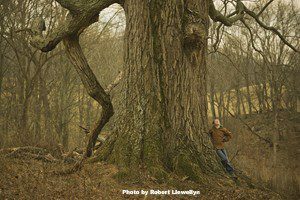 With the help of Jeff Kirwan, retired VT forestry professor, and co-author of Remarkable Trees of Virginia, they located most of the trees on their list. The non-native white willow, (Salix alba), at the Duck Pond was one of the largest they saw. 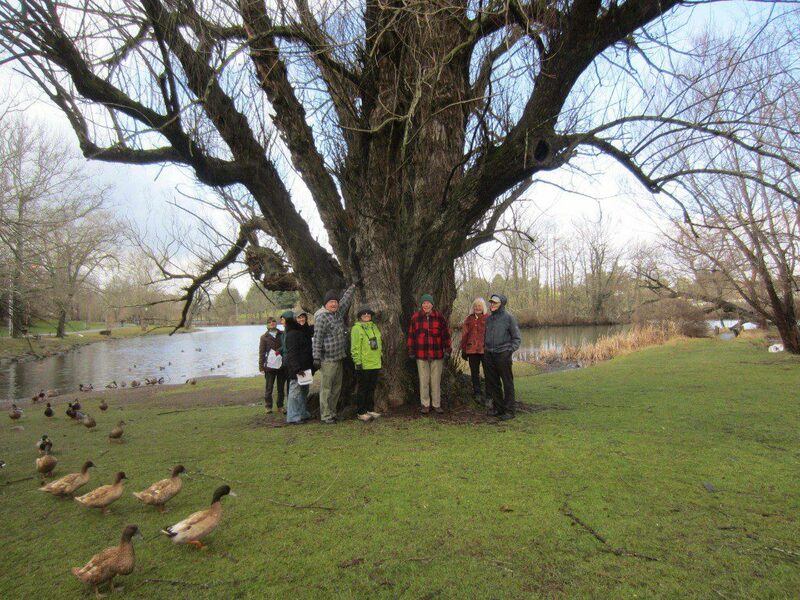 The champion white willow, Salix alba, at the Virginia Tech Duck Pond, with the tree hunters. From Left: Brenda Graff, Su Clauson-Wicker, (facing ducks), Denise and Frank Matthews, Lucinda Jennings, Jeff Kirwan, Beth and Fred Umberger. Photo by Mary Rhoades. 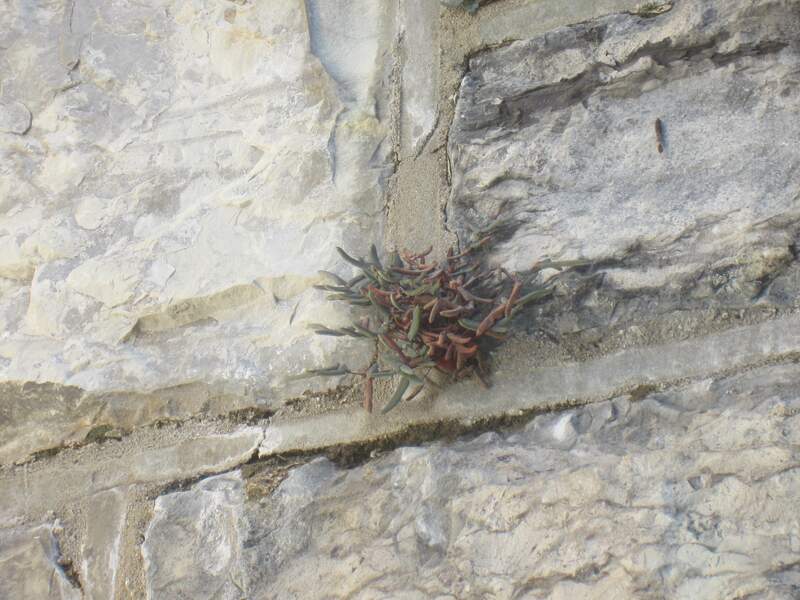 An unexpected treat was finding lots of Smooth Cliffbrake fern, (Pellaea glabella), growing on one of the stone buildings on campus. A check with Tom Wieboldt revealed that he has seen it and P. atropurpurea on two other buildings at VT, and that it grows on the limestone cliffs along the New River. Gary Cote of Radford added that P. glabella is also found in Wildwood Park. Smooth Cliffbrake fern, Pellaea glabella, growing on the side of a campus building. The Big Tree Program, started in 1970 as a 4-H and FFA project, is now a nationwide database. This year Virginia ranks fourth in the national register, after Florida, Texas, and Arizona.The photo below shows the Virginia state champion red oak; discovered during a 4-H big tree contest in 2007. You can search the national database by state champs, national champs; by county or city; by tree genus; and by measurements, (including “dead”), at the Virginia Big Tree database. The adventure was enjoyable and rewarding enough that we decided to make a Big Tree Hunt one of the field trips for the 2016 Annual Meeting of VNPS in Blacksburg this September. 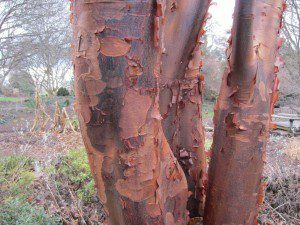 We’ll be looking at the native trees that weekend! Be sure to mark your calendars for September 9-11; we have already planned lots of fantastic field trips for this year’s Annual Meeting. One will be a trip to the Poor Mountain Natural Area Preserve with Ryan Klopf , from the Natural Heritage Program. The featured plant Poor Mountain is piratebush, (Buckleya distichophylla), a hemi-parasitic plant. And a trip to private property in the Sinking Creek Valley led by Tom Wieboldt that includes a variety of habitats. There will be two trips to sample the Mountain Lake Wilderness area, one at the top of the mountain, and one near the base. Sadly not long after the picture above was taken the willow tree was considered unsafe and pruning it was considered labor intensive so the tree was cut down. Some large ash trees had to come down as well. The Emerald Ash borer was discovered and they could not be saved. Beth, that certainly is sad news. Let’s all be looking for every opportunity to plant more trees, and to conserve more land as we move forward. We have to keep hoping, and to keep setting examples! There is a huge oak tree on Glade rd at the Blacksburg City limits sign. Meadowbrook rd turns to the right, oak tree on left. I am concerned that this tree may be cut by power company. Looking for some advice on how to save this beauty.